Do Detectives Think? is not a great comedy short. But it does illustrate a truth about comedy in general, and slapstick comedy in particular: Believable characters in unbelievable situations remain believable. Or to put it another way: a good protagonist can elevate a bad plot. So can a pair of them. 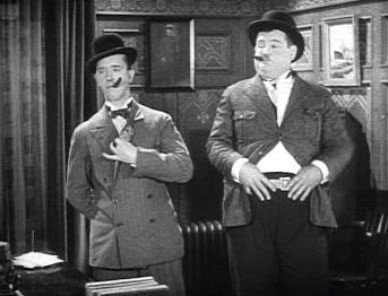 With several films already under their belts as a duo (and many more from their days as singles stars for Hal Roach Studios), Stan Laurel and Oliver Hardy pretty much had their characters down by the time Do Detectives Think? came around. The Laurel we see here is the one we know: an oblivious, minorly anarchic little man. And Hardy is familiar too: the scolding, overwound fusspot who uses propriety to mask his insecurities. Both mean well. Neither do much good. That’s what Laurel and Hardy play this time: detectives. “Ferdinand Finklebery” and “Sherlock Pinkham” (thankfully, the names are mentioned only once). They’re charged with guarding the home of Judge Foozle (Jimmy Finlayson) and his dishy wife (Viola Richard) against a throat-slashing escaped con bent on revenge. Finlayson, a regular foil for laurel and Hardy, looks a little like Chester Conklin here. 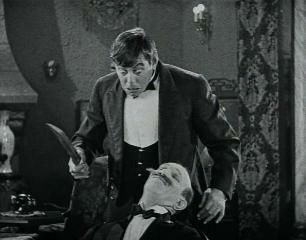 The killer (Noah Young) looks like Mr. Hyde. The wife looks just right. You’d think most of the film would take place in the house. In fact, it takes nearly half the 23-minute running time for Stan and Ollie to get there. This is mostly due to a pair of standalone gags executed along the way. 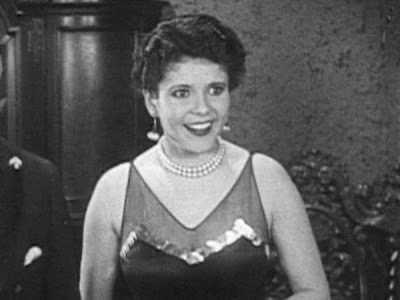 Regular readers of this blog know my opinion on standalone gags in comedy films (for a refresher on that, read my post on The Patsy—a film you probably liked better than I did). But in this case I’m conflicted. These two gags may indeed have been the ones to cut from Do Detectives Think?—but they’re also the best two gags in the film. The first takes place in front of a cemetery. It is night. As Laurel and Hardy pass the cemetery’s entranceway, Laurel’s bowler hat is caught by a gust of air and sails through the gates. Hardy’s soon follows. This presents a problem, as both men are afraid of ghosts. This is silly. Two grown men, even foolish ones like these two, would not be so juvenile as to be paralyzed with fear at the thought of stepping just a few feet into a graveyard after-hours. And if they were, surely they’d have found another route to the judge’s house? The gag does nothing to advance the story of Do Detectives Think? 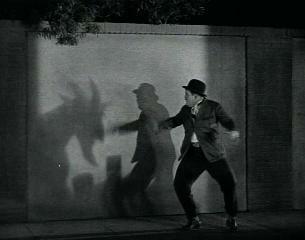 It seems better suited to lesser comedians—the mugging Larry Semon-types. But there is a defense of it. If the gag itself is a bit beneath Laurel and Hardy, and an awkward fit for the film, you can at least argue that it’s driven by the characters themselves. Note that it’s Hardy, the more timid of the two (but the less obviously so), who prods his impressionable partner into the danger zone alone. Here’s why that’s interesting: if we must accept that a man of Hardy’s age and bearing is scared of ghosts, what does his willingness to endanger Laurel tell us about him as a character? Laurel is his friend and partner, after all. Isn’t he? I don’t have the kind of comprehensive knowledge of Laurel and Hardy silent films that I do of Keaton’s or Chaplin’s (though I’m working to fix that). Still, I think I’ve got a handle on their peculiar chemistry as a comedy team. These two characters aren’t terrible people, but they aren’t likeable, and they don’t fit well into society. That’s part of it—though they share these traits with almost all the other major silent clowns except for Harold Lloyd. Here’s the other part: Laurel and Hardy don’t like each other more than anyone else likes either of them. Consider Hardy’s persona. He’s obsessive about propriety; he’s prim. He clings to established ways of doing things, because doing them makes him feel like he’s part of something. His self-esteem is low. Who could be a worse companion for this man than Laurel? Laurel barely adheres to social norms; worse, he doesn’t appear to try. Hardy bullies him as a result. And you have to wonder if, underneath Hardy’s frustration, is the realization that Laurel is the only kind of friend he’s able to have. No wonder he’s so miserable. Laurel, were he less oblivious, would likely dump him. None of this detracts from the funny of course. And indeed, the somewhat-lame cemetery gag slips elegantly into a routine with the hats, where the flustered Hardy continually picks Laurel’s too-small bowler instead of his own. This joke works on three levels. First as a character-driven gag, because it’s Hardy’s impatience combined with Laurel’s pliability, that causes the mistake to keep happening. Second, as a piece of virtuoso slapstick, as the duo switch their hats as fast and cleanly as a pair of shell-game grifters. Third, as broad comedy, because Laurel’s hat, too small, perches like a bird atop Hardy’s head, while Hardy’s hat slumps over Laurel’s ears. This is class-A stuff. The rest of the film, not so much. I took simple pleasure in the chase itself, once it finally began, but not as much as Noah Young, waving his ridiculously large butcher-knife around Foozle’s pad and grinning like someone twice as crazy as the man he portrayed. Of note: in this sequence Hardy again puts his own life ahead of Laurel’s. There are better Laurel and Hardy silents out there. Even a neophyte like me knows that. But I do consider Do Detectives Think? is a decent place to start. You don’t get their best work here, but you do, indisputably, get them.